I haven’t yet had a good go at last Friday’s cryptic, and tomorrow’s public holiday for Melbourne Cup Day, at least in Melbourne, is shaping up as a good time to devote myself to DA. 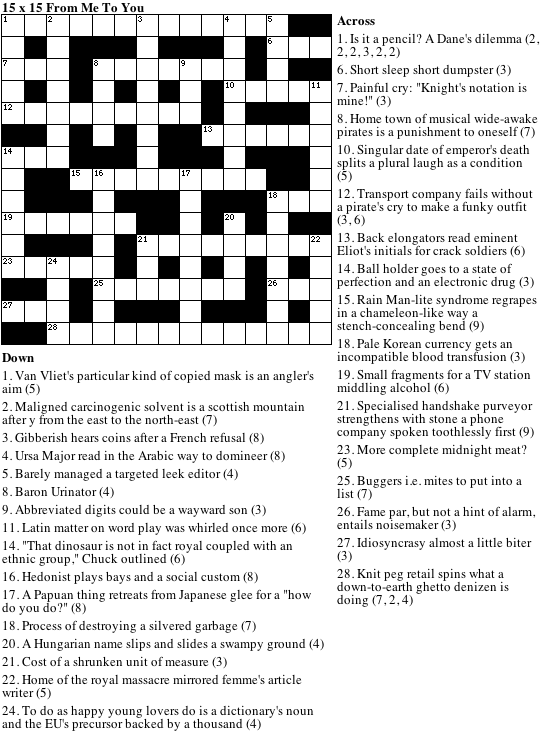 But, in the meantime, here’s a little cryptic crossword I prepared earlier. It was my first attempt at creating a 15 x 15 cryptic, and, well, it was fun. Very enjoyable crossword. Impressive effort, AS. I have one to go, which at this stage has me stumped, despite having the majority of the letters. If you would like some feedback, I would be happy to oblige. Perhaps after a week or so to let others have a go too. I detect a distinct DA influence, with the slang and sly humour (one induced a DA-ish groan), along with one or two more erudite clues. Of course, I was sucked in from the start by the 60s music clue. As I have confessed before here, that’s my era! It’s good to hear that you enjoyed it. Looking over it, I notice I was a little inelegant on a couple of clues, and I should have just copied the shape of an already existing crossword instead of trying to create my own, but I think it’s mostly OK.
RC’s bete noir was 10 across; I’m wondering whether yours is the same. And keep up the Beefheart love. Oops! I missed an ‘e’. Have you heard of the funk band ‘The Meters’? Presumably they have been reissued on CD? Are you a fan? Any recommendations for best album? I think The Meters caught the tail end of the sixties, but they were predominantly a seventies band. They were a mostly instrumental funk band, and, undoubtedly, you’ve heard they’re music. They’ve been raided wholesale these days by R&B and hip hop groups, and are generally played as background music on various things. It’s probably best to get a Best of the Meters. Their albums did not really follow a theme and each song can be listened to in isolation without a drop in overall quality, so it’s best to just get their best stuff all together on one CD or collection. Have you seen the pirate’s keyboard?